WASHINGTON—According to a report published this week by sociologists at American University, the vast majority of parents across the country are willing to entrust their children to anyone wearing a plush character costume. “Our data show that roughly 95 percent of all U.S. parents are perfectly fine allowing their young children to approach, hug, and even sit on the lap of literally any individual, provided that person is inside a soft full-body costume depicting some friendly-looking character,” said lead researcher Carol Milano, noting that her team observed hundreds of instances in which adults displayed no nervousness or reluctance whatsoever about their small child being picked up and nuzzled by an unidentified person at a Single-A baseball game, shopping mall, or theme park if that person happened to be wearing a bulky outfit designed to resemble a cartoon elephant, tiger, bear, or duck. 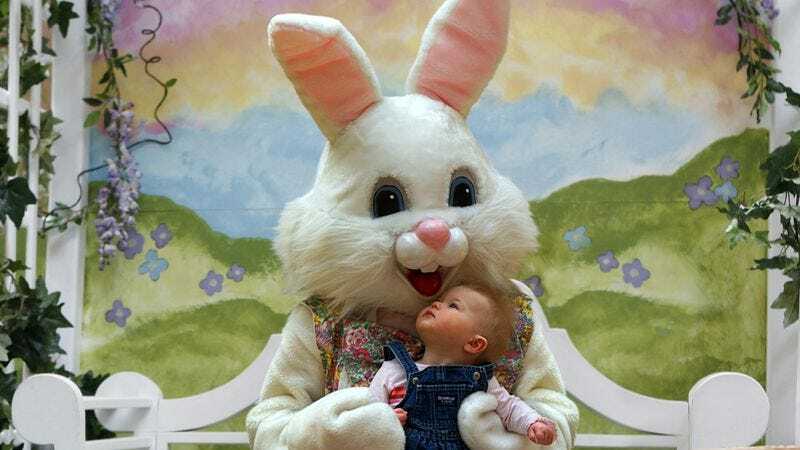 “Generally, most parents simply presume that someone in an Easter Bunny costume must have some level of professional training and can be trusted with their child’s safety and well-being. In almost every case, however, this conclusion is arrived at without speaking a single word or getting a look at the stranger staring out through the black mesh mouth of the character’s oversize head.” A related report revealed that 97 percent of children only feel truly safe and happy when an anonymous person in a character costume embraces them.